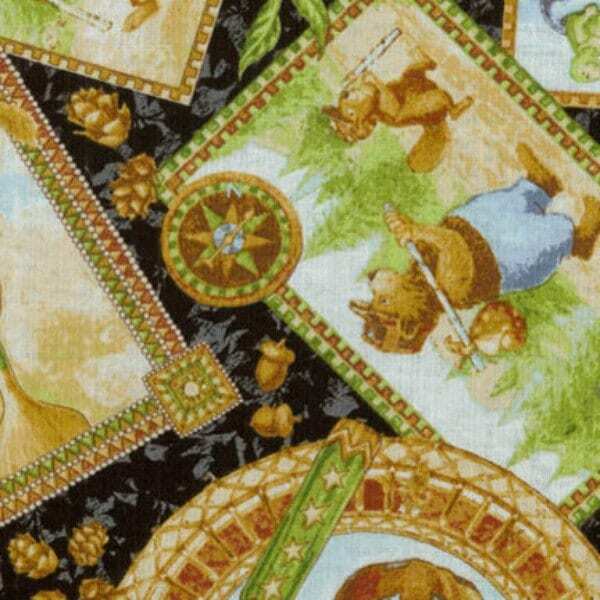 A children's fabric depicting a happy fishing bear. A variety of tossed animals such as bears, squirrels, fish, cabins and everything you need to enjoy a week-end of fantasy and relaxation. A beautiful blue, gold and tan background combined with blues and greens gives you the opportunity to combine any fabric to create a beautiful quilt or any project. Add this cute fabric to the linear fabric and you will have a beautiful project created in an evening. All fabric from The Quilted NurseryChildren's Fabric Store is cut directly from the bolt offering generous cuts. Same day shipping always!